At issue in the Havasupai case was whether an Arizona State geneticist had obtained permission from tribal members to use their DNA for anything other than finding clues to Type 2 diabetes. More than 200 of the 650-member tribe signed a consent form stating that their blood could be used to “study the causes of behavioral/medical disorders,” but many said they had believed they were donating it only for the study of diabetes, which tribal members suffer from at extraordinarily high rates. When they learned years later that the DNA samples had been used to investigate things they found objectionable, they felt betrayed. There are couple of issues embedded here: First, can scientists use blood for research purposes other than the reasons stated at the time of collection? This is a bit complicated as sometimes research can end up taking a different direction. But then the donors, perhaps, should be informed of the new direction and asked for a new permission. And this was the basis of the settlement reached between Arizona State University and Havasupai Indians. But this can also become quite cumbersome - and problematic, especially when anonymity of specific donors is also being protected. Some have proposed an international tribunal akin to the Helsinki human rights agreement, which would lay out the ethical obligations to research participants. Others suggest staying in touch with subjects so they can be consulted on new projects — and because under current practices they tend to learn of breakthroughs based on their own DNA only if they become close readers of scientific journals. Courts have ruled that individuals do not have a property right to their cells once they are taken in the course of medical care, but they do, under federal guidelines, have a right to know how they will be used. Complicating matters is the increasing impossibility of ensuring that DNA data can remain anonymous. Do participants need to be told that their privacy cannot be guaranteed? Can “blanket” consent up front do the trick, or is even that misleading because researchers can’t adequately describe the scope of studies they have yet to design? Is it O.K. to use DNA collected for heart research to look for genetic associations with intelligence, mental illness, racial differences? For one thing, “we have to communicate a hell of a lot better to the public what is going on when we put their specimens in our biobanks,” said Stephen J. O’Brien, a geneticist who runs the Laboratory of Genomic Diversity at the National Institutes of Health. But what caught my attention here was a larger issue. 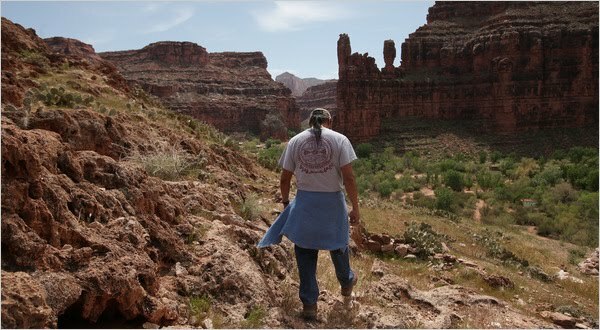 The DNA research showed that the ancestors of the Havasupai originated in Asia, contradicting the origin story of the tribe originating in the canyon and, thus, being assigned as its guardians. What if the Havasupai did not want to subject their DNA for migration studies? What if their origin story plays an important role in their identity and they want to protect that? Well, I guess this should be their right. This got me thinking about young earth creationists or Muslim creationists who reject evolution. Can they argue for a similar protection from a scientific view of the origin of humans? I guess this would be okay (though suicidal for development) in their own private schools - which they can still do. This demand would also be reasonable if crucial evidence for evolution dependent on the cooperation of these creationists (say if their DNA was really unique). Phew! I'm glad there is sufficient evidence without that. Oh boy - the last issue adds a whole other layer of political complications. Combine it all together and we return to the basic issue of trust. My fellow scientists - lets be careful and open about how we present our research. Read the full article here and another one here. Also see this earlier post on Science, tissue-ethics, and faith-healers. Of course, you don't need the genetic test to show they didn't originate in their valley. Or indeed, the genetic test doesn't prove that they weren't (maybe their creator made them with genes like that, then set them down in the valley). This issue of land rights is often applied specifically to the cases of Native American tribes - and often comes up in legal cases. In the courts, it is hard to argue that their creator may have made genes that way. For example, the decision in the case of the famous Kennewick Man was based on the European ancestral lineage against the tribe's claim of family connections.